What graphics card within my budget gives me the best bang for my buck? That single, simple sentence cuts to the core of what people on the hunt for a new graphics card are looking for: The most oomph they can afford. Sure, graphics cards are complicated pieces of modern technology, powered by billions of transistors and countless other types of intricate hardware, but people just want to crank the detail settings on Far Cry and just plain play. Answering the question can be a bit trickier than it seems. 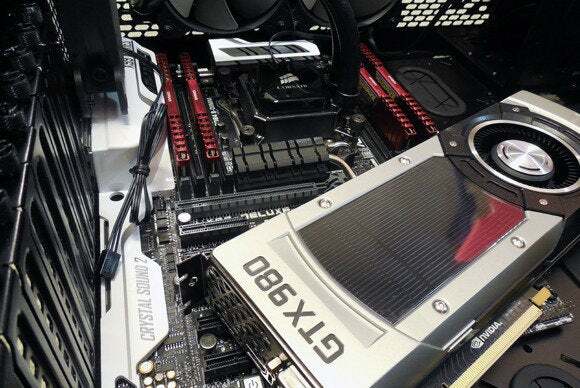 Raw performance is a big part of it, but factors like noise, the driver experience, and supplemental software all play a role in determining which graphics card to buy, too. Let us be your guiding light. 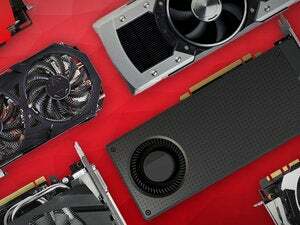 We’ve tested graphics cards of all shapes, sizes, and price points to nail down exactly what you can expect for your money—from itty-bitty $90 cards to fire-breathing $1000 models to behemoths with not one, but two graphics processors and custom watercooling loops. We’ll also talk a bit about the “extras” that can sway your buying decision, like Nvidia’s ShadowPlay software and AMD’s TrueAudio, and we’ll issue buying recommendations for various price points. Finally, I’ll update this article with performance data from every new GPU that launches going forward, so you’ll always have the most recent information at hand. Graphics cards are expensive. Choosing one can be complicated. But it won’t be after reading this. Let’s dig in. Editor's note: If you want to skip all the benchmarks results and the talk about Nvidia- and AMD-specific features, jump to the last page of the article for our buying recommendations, separated by price point. PCWorld’s graphics card testing rig. Hold your horses! Before we dive into raw numbers we need to detail our test system and the cards we’ve tested. If you want to jump right into the juicy benchmarks, skip ahead to the third page. Buying recommendations are on the final page of this article. Still with me? Great. Here are the details of our test rig. Yes, it’s powerful—and definitely overkill for gaming—but that eliminates any pesky potential bottlenecking situations in the system. For more information you can check out our build guide for PCWorld’s graphics testing PC. 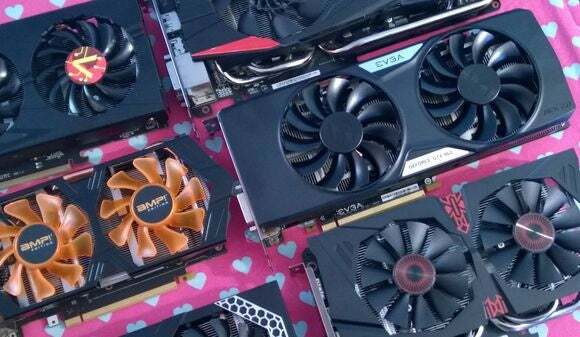 We tested as many different GPUs as possible—one GeForce GTX 750 Ti, one Radeon R9 390X, et cetera—with a preference for models with custom cooling solutions, in order to mimic as realistic a scenario as possible. Some high-end reference cards are also included, however. Models of all current Nvidia GPUs have been benchmarked, but you’ll notice some missing Radeon models, such as the R9 285 and the R7 370. This is due to a few things: PCWorld’s graphics card review coverage was kind of light past years, and when AMD updated its entire graphics card lineup to the R300-series in one fell swoop, they didn’t send publications review samples. We managed to scrounge up high-end models, but nobody wanted to send us entry-level Radeon R7 graphics cards to review. That said, this is a fairly comprehensive look at the current landscape, from top to bottom. Next page: Details about the graphics cards we tested.